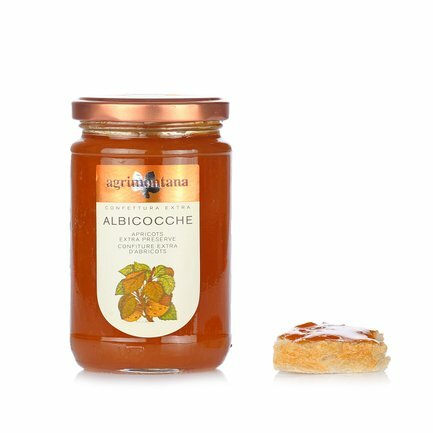 With Agrimontana preserves, you can discover the full flavour of just picked ripe fruit every morning. The apricot extra preserve, in particular, contains 70% fruit, in addition to high-quality cane sugar from the island of Mauritius and lemon juice. The ingredients are of the best quality and are mixed according to traditional recipes. Try these preserves on a thick slice of hot bread, or each time you are looking for a sweet but natural treat. Ingredients IQF frozen apricot halves, 560 g to 1000 g of compote. Pitted fruit, free from heavy metals, mould, insects, foreign inorganic and plant matter. Grape juice, lemon juice and gelling agent. No added antimicrobial agents, antioxidants, colouring agents or f For more information on product labels, please contact our Customer Service department. The information on the labels of the products may vary for reasons beyond our control, therefore, there may be discrepancies between the information on the site and that on the products delivered. Please always check the information on the product before consumption or use. Agrimontana was established in 1972 in Borgo San Dalmazzo (CN). It soon became a leader in candied fruit and chestnuts in particular, and offers its excellent products to consumers, confectioners and chefs. The chestnuts are selected in Piedmont, in the only area able to guarantee the superb characteristics and aromas and flavours that make them incomparable. The fruit jellies do not contain added flavours or colours. The fruit preserves and the candied fruits are like those your grandmother made...or perhaps better.